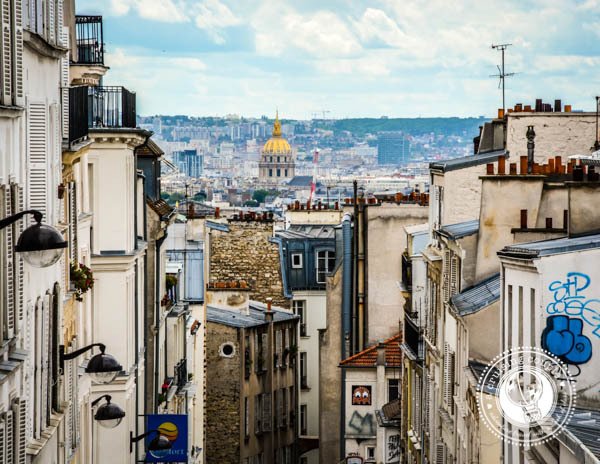 Montmartre is one of our favorite areas in all of Paris. In between the atmospheric cafes, the small cobblestone roads and the rich history of writers and artists who once called it home, there’s just something wonderfully romantic about ambling through the neighborhood. Sure, there’s the super-touristy (though magnificent) Basilica of Sacre-Coeur at the top of the hill. And then there’s the slightly sleezy Pigalle area at the foot of it. But in between are Montmartre’s narrow alleyways and quiet stairways, and that’s where a sense of magic still prevails. 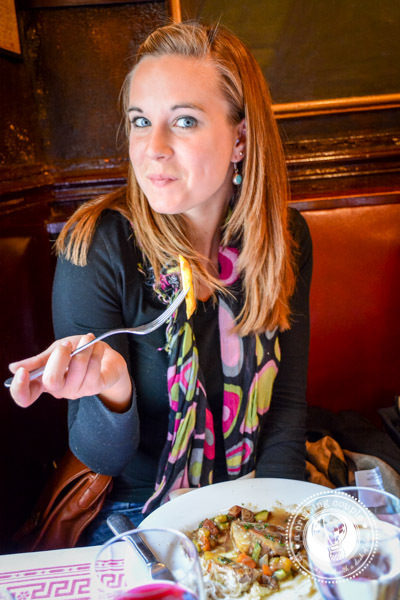 When we discovered we could take a food tour through Montmartre, we jumped at the opportunity. 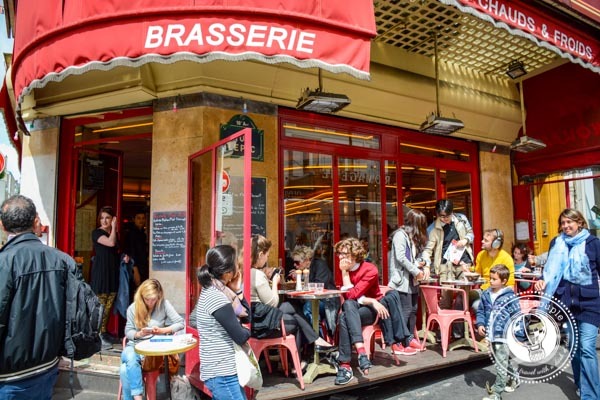 It would be the perfect way to gain culinary insight to Paris, largely considered to be the gastronomic capital of the world, while also giving us an excuse to indulge in as many French calories as we pleased. Contrary to popular belief, French food doesn’t have to be fussy and fancy; many French actually consider it to be the simple meals that are often the best. But what not even many Parisians realize is that Montmartre is a haven for foodies. Some restaurants and shops in the neighborhood are still family-owned, and have been passed-down from generation to generation since the early 1900s. 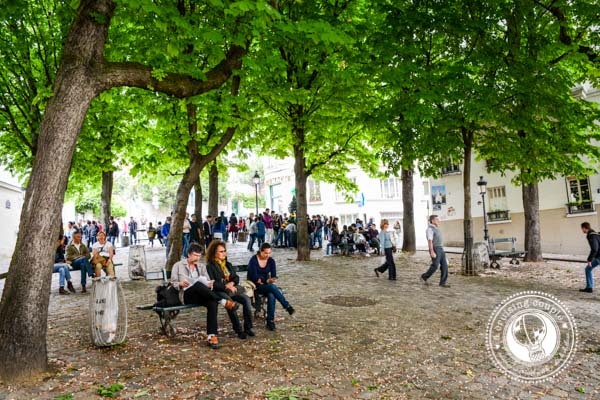 Go for a stroll up the hill and you’ll find numerous small, gourmet shops specializing in the best French meats, cheeses, oysters, or even absinthe. And if you’re looking for a bit of proof behind the claims, a different bakery from Montmartre has taken home 1st or 2nd prize each year in Paris’ annual baguette competition—and that’s amongst nearly 2000 participants. Maybe it’s something in the water. Or maybe it’s just a neighborhood secret. 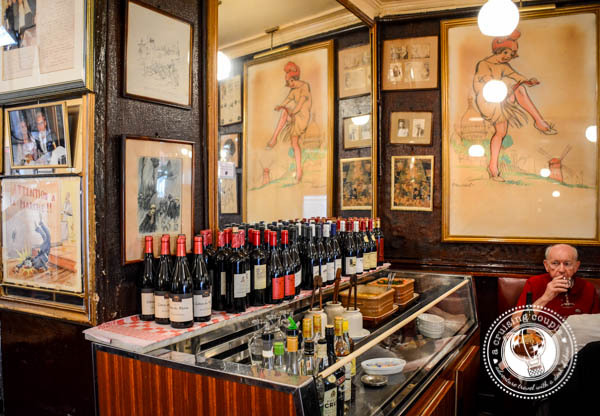 Either way, this corner of Paris has some serious good eats to discover. The brasserie where Amelie was filmed. 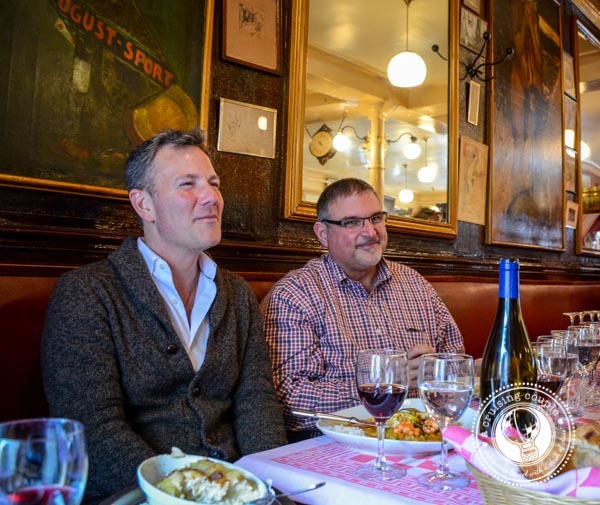 John-Paul, founder of Culinary Tours of Paris, was our guide on our three-hour Montmartre Moveable Feast. And a moveable feast it was. Our food tour was like a leisurely three-course French lunch, with each part of the meal enjoyed at a different restaurant. First up on the menu was an entrée (appetizer) of charcuterie and fromage, or mixed meats and cheeses. 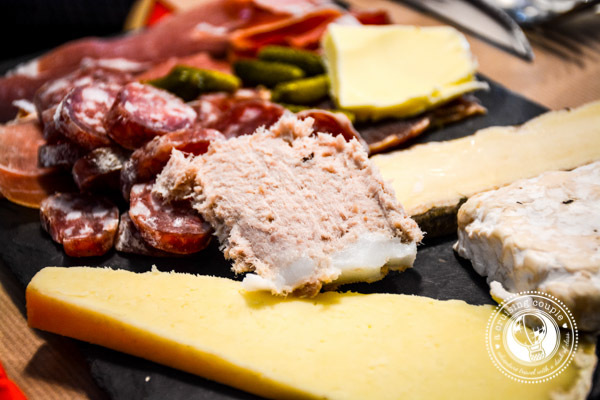 The assortment consisted of sausage, ham, blue cheese, Cantal cheese and Saint-Nectaire cheese, all from the region of Auvergne, France. To wash it down, we split a carafe of red wine. 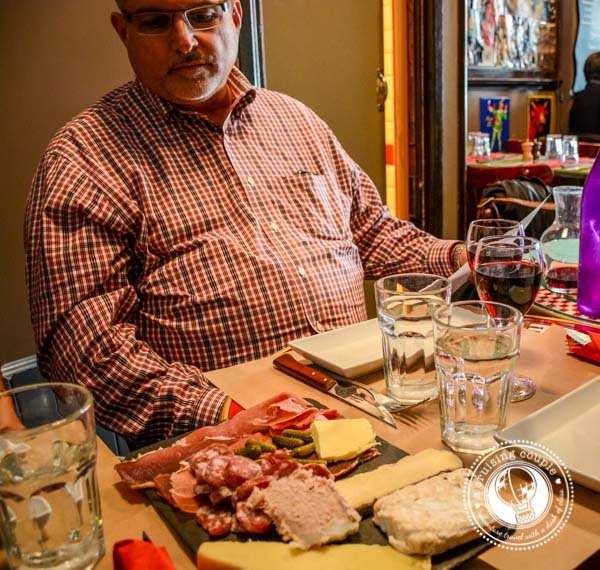 While sampling the spread (the subtle blue cheese proved to be everyone’s favorite) we took the opportunity to ask John-Paul more about French beer and wine culture. Perhaps surprisingly, the French used to drink quite a lot of beer; however, this stopped when the country was continually getting into fights with Germany. Beer drinking is becoming increasingly popular once more now that the two countries are a bit more amiable towards each other. You’ll primarily see the French drinking beer in 25cl glasses—which is about half the size we’re used to! When it comes to wine, the numbers show that wine consumption across the country is actually declining. But as a visitor to the country, you would never know it. Wine is everywhere and it’s still what you’ll see most French drinking with their meals. As we savored our own glasses of vin rouge it was easy to see why—a glass of the house wine is often less expensive than a soda or bottled water, and still absolutely delightful. For us the hardest part about French wine isn’t consuming it, but knowing which of the many bottles to choose from! To help us a bit, John-Paul informed us that French wine is classified into four categories based on their quality: an Appellation wine (A.O.P) is the best, followed by a Vin Superieur (V.D.Q.S), Vin de Pays and finally, a Vin de Table. Though we likely could have sat and ate the charcuterie and fromage for the rest of the afternoon, our culinary education was only beginning. It was time to stretch our legs and go get our main course. The next stop on our journey was a family-run restaurant in operation for over 100 years. The small and cozy restaurant was nothing less than charming. The first thing we noticed were the walls adorned with photos, memorabilia, and artwork, many original works of the famous artist Poulbot. We relaxed into a corner booth, the only tourists in the establishment, and graciously allowed John-Paul to translate the French menu for us. The menu changes each day depending upon what ingredients are available from the market, but we had no shortage of options to choose from. After a bit of difficulty and indecision, we finally picked guinea fowl wrapped with bacon and pan fried, and a red wine braised beef. Our tour companions opted for the scallops and a fish soup. Faced with the difficult decision of choosing a wine that would compliment everyone’s wide-ranging meals, John-Paul suggested a bottle of chilled Brouilly, a subtle red that goes well with just about everything. We particularly loved that the wine came from such a small winery that the producer actually put his cell phone number on the bottle! Each dish we tasted was phenomenal, and even to our own uneducated palates, it was clear that this was authentic French cuisine as its finest. It might not have had the chic design of a Michelin-starred restaurant, but as the owner shook each of our hands on the way out, we knew this was one French restaurant we would make an effort to return to. Luckily we had a bit of a stroll to digest and make room for our third and final destination: dessert. 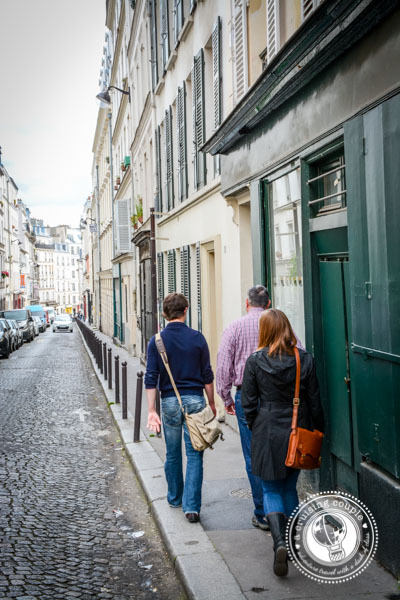 While we slowly ambled through Montmartre, John-Paul told us a bit more about the neighborhood. To our right was Picasso’s home. 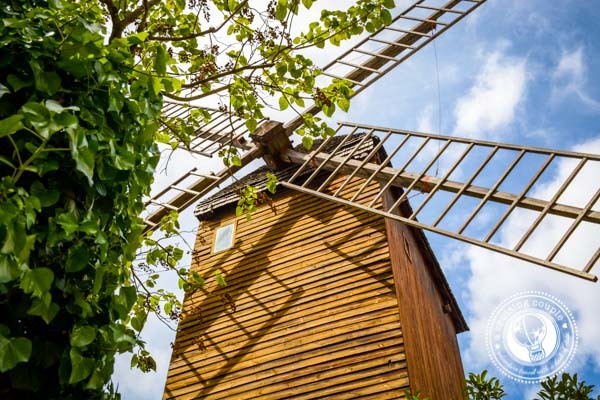 Around the corner we found Van Gogh’s house, and the characteristic windmills that inspired some of his paintings. 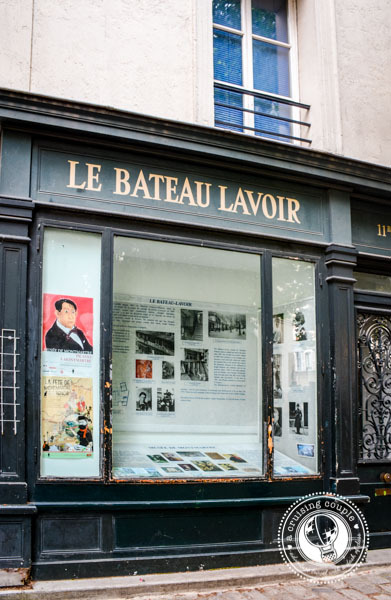 Just a little further on we stumbled upon Le Bateau-Lavoir, a nickname given to the building that served as a residence and meeting place for some of the most outstanding early 20th-century artists and actors. It would be easy to walk past these unassuming buildings without any realization of their place in history. Though still busting at the seams from overindulging on the appetizer and main course, it only took the aromatic smell wafting from our final destination to convince us we still had a bit more room in our stomachs. We were at a creperie, believed by many to have the best crepes in all of Paris. We tucked ourselves into one of the quiet corners, thankful to have a reservation as every other table was full. We took one look at the extensive menu and swooned. We’ve never seen so many delectable crepe varieties, both savory and sweet. After one of the most difficult decisions of my life, I opted for the homemade caramel apple crepe with a dollop of vanilla ice cream. Dan went for the chocolate and banana. Though they sound quite heavy and rich, both crepes were surprisingly light, allowing for the delectable flavors of the crepe itself to shine through. Seeing as how we had already had a bit of wine to drink during the day, we complimented our crepes with a typical French cider. Different from other European ciders, the brew was a deep, amber hue with strong carbonation. We were pleasantly surprised to find it subtler and less sweet than the American ciders we are accustomed to. Despite the sweetness of the crepes, the cider was the perfect compliment. We love food tours. Dan proposed after a chocolate tour through Boston and we celebrated our second wedding anniversary with a food tour in Hong Kong. Given our previous experiences, we had quite high expectations for the Montmartre Moveable Feast. Luckily, we can say without hesitation that our culinary tour of Paris was more than we could have hoped for. John-Paul is an extremely knowledgeable and fun guide, with massive insight to the French food scene. His passion for what he does is obvious and infectious. If you’re looking for a real and authentic Parisian experience, then Culinary Tours of Paris is a must. 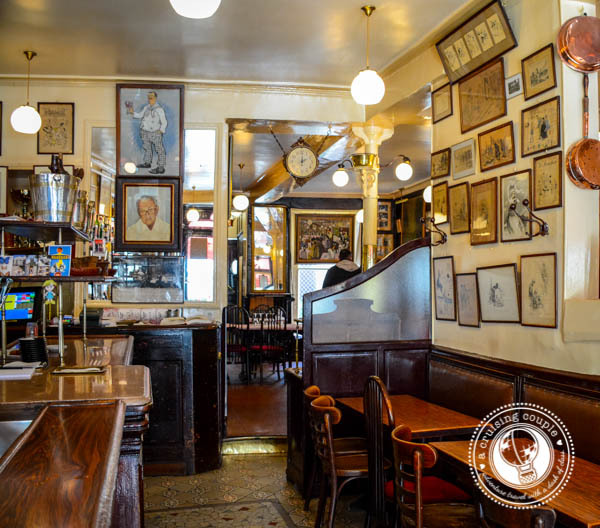 John-Paul offers three different culinary tours: the Montmartre Moveable Feast; Eating and Strolling in the Latin Quarter; and an Aperitif Tour. Group size is maximum 6-8 people and about 3 ¼ hours long. Visit Culinary Tours of Paris for more information or to make a reservation. We were guests of Culinary Tours of Paris. All thoughts, opinions, and decisions to lick our plates clean were—and are always—our own. Have you taken a food tour before? Does this sound like a great afternoon in Paris to you? Was in Paris for 6 months last year and I am seriously starting to crave the amazing simplicity of French food – give me a baguette, some Normandy butter and cheese and I’m a happy girl! The post was nostalgic for me since Richard and I visited Montemarte and loved it! Just sorry we did not know there were food tours available. Thanks for sharing another wonderful adventure. A food tour in Paris sounds perfect! 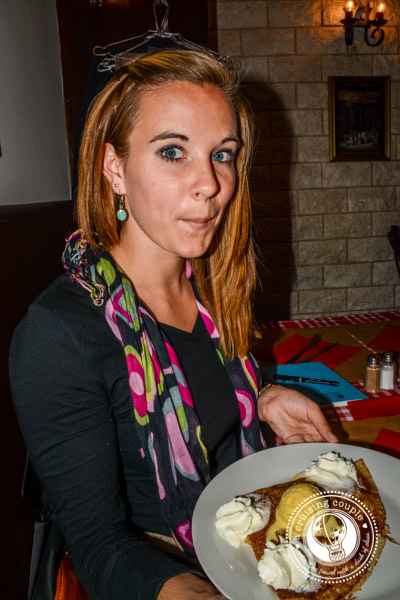 I loved the crepes in Europe (never been to Paris, unfortunately), but those look even more tasty! The vanilla ice cream is so yellow! omgsh that looks so delicious! I stayed with some friends in paris and we had home cooked meals which were yummy, but it meant I didn’t get to eat out much. Thanks Franca! 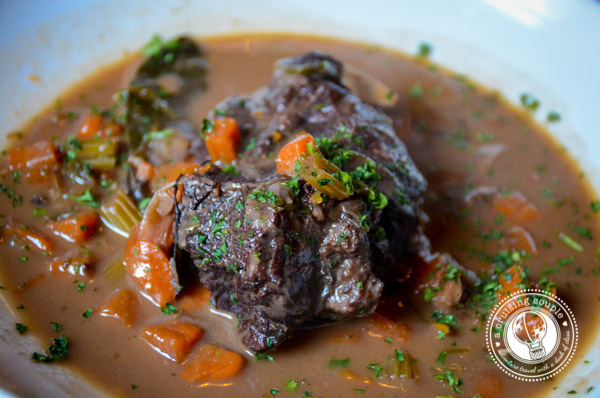 So glad to hear that you loved Montemarte as much as we did! Casey, We also love food tours…well, any kind of food. But, French food…yum! I know it’s half the Amelie fan in me, but I have always loved Monmartre the most of any neighborhood in Paris. So beautiful, walkable, and yes, always makes me feel as though I’m in an adorable romantic film. So glad to hear you’re a fellow Montmatre lover :) It’s just such a cool place! YUM! This sounds perfect! I would have loved to try something like this, too! So cool. Thanks for sharing it with us! Wow!! I am so hungry reading this! I recently discovered food tours for the first time, doing one at home in London for my birthday and then one in Ljubljana recently. Paris must be an amazing place to take a food walk though and I’ll definitely keep this one in mind for next time I visit there! I love that you got engaged after a chocolate tour! Oh wow! So happy to have come across your blog (via Pinterest ). We’re going to be in paris for 10 days in late April for our belated honeymoon. We’ve decided to do one food tour per major cities and for Paris we’re looking to book this exact tour ! So thank you for reviewing this. We will now happily book it! 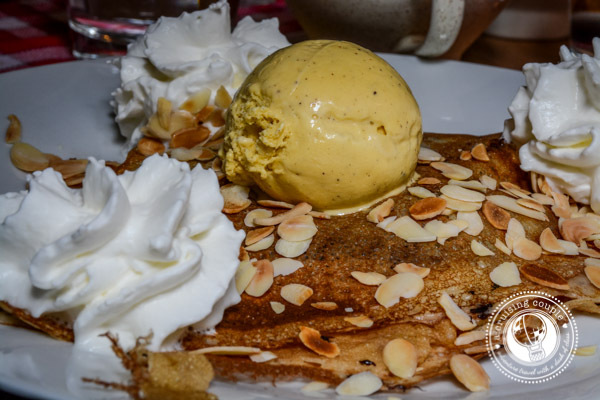 Can you tell me the name of the famous Creperie place you went when you did the food tour? I’m going soon to Paris and would like to visit this place. Thanks for the info, on my last trip I didn’t explore that area of Montmartre and by reading this you just gave me a lot of inspiration! My husband and I took this food tour based on your recommendation and it was great! 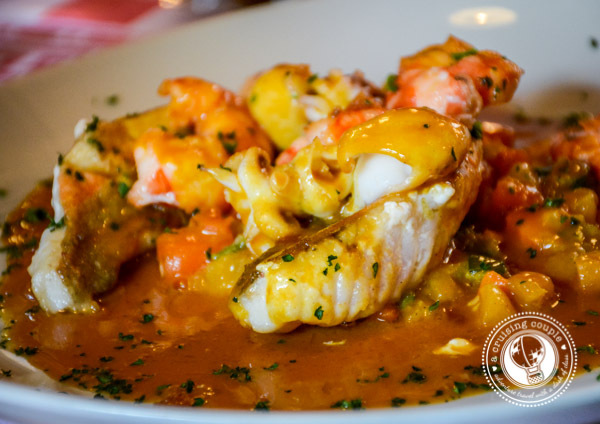 The food was excellent, John-Paul was really knowledgeable and entertaining, and Montmarte was charming. I’m so glad to have heard about this tour! A Cruising Couple recently posted…Looking For The Most Gorgeous Island In Thailand? Try Koh Lipe. My boyfriend and I took this tour last week per your recommendation and absolutely loved it! So glad I came across your post! So happy to hear that! Thanks for taking the time to let us know – it’s always awesome to know when readers have as much fun as we did on trips and tours :) Happy traveling!